I felt a twinge of uncertainty overtake me as we set out on the path in the early morning, the fog dancing through the trees like a siren, waiting to draw us into its murky grasp. 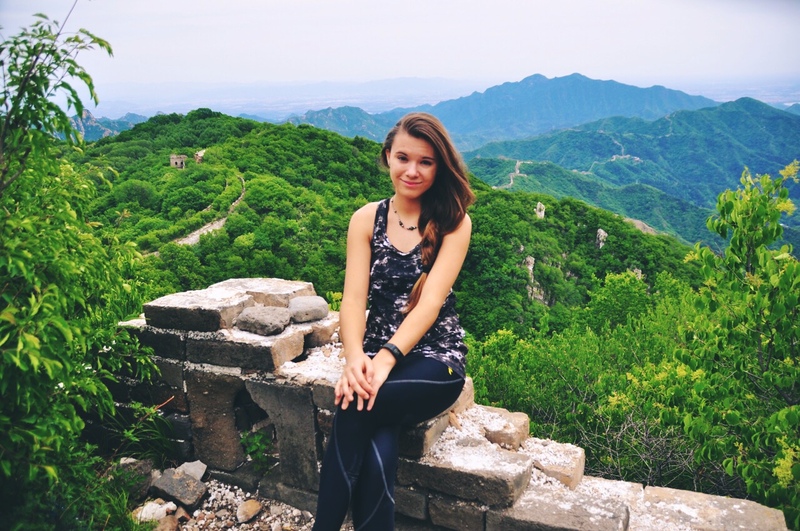 The cool mist had always had a calming effect on our fast paced morning routine of packing up our backpacks and furiously stuffing in our sleeping bags, but as we trekked down the path, chatting with our Polish walking companion Hanya, my apprehension seemed to grow with every step. The reason? 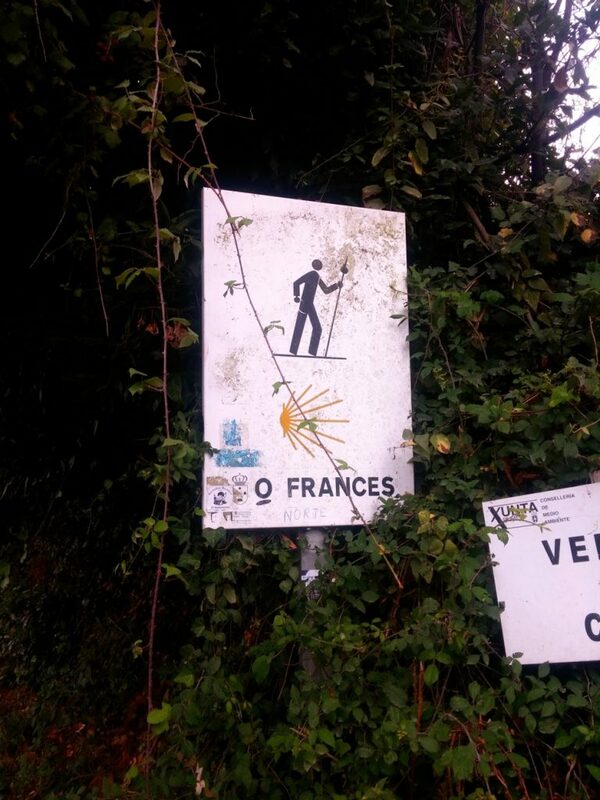 The Camino de Santiago del Norte was over. It had concluded with us arriving in last night’s city of Arzua. 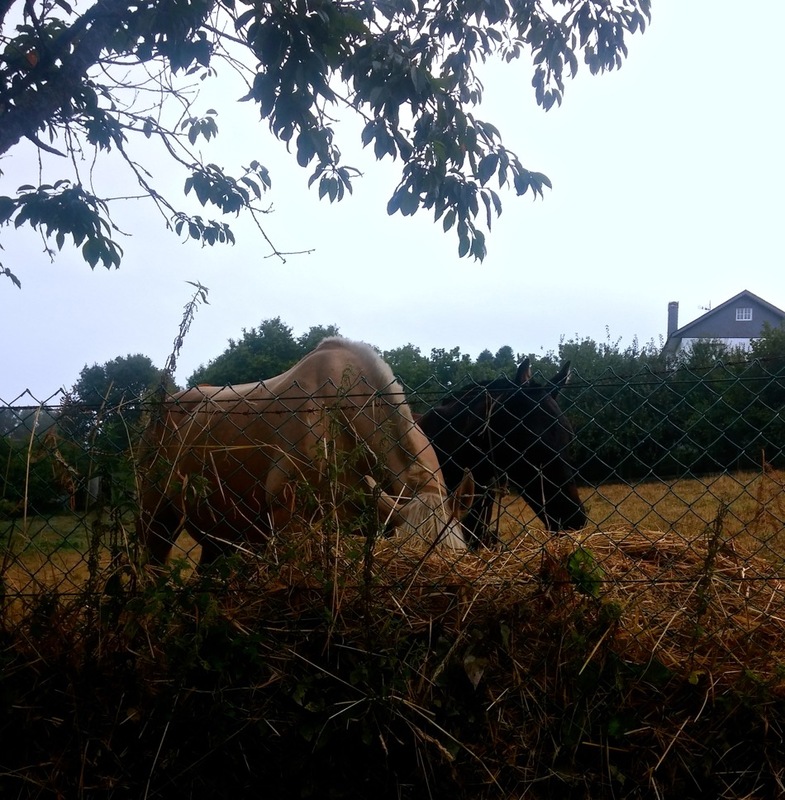 Now we had merged with the Frances branch of the Camino and would follow its unswerving arm until the very end. I watched the track ahead of me with deer wide eyes, sensitive to every new sight and sound. 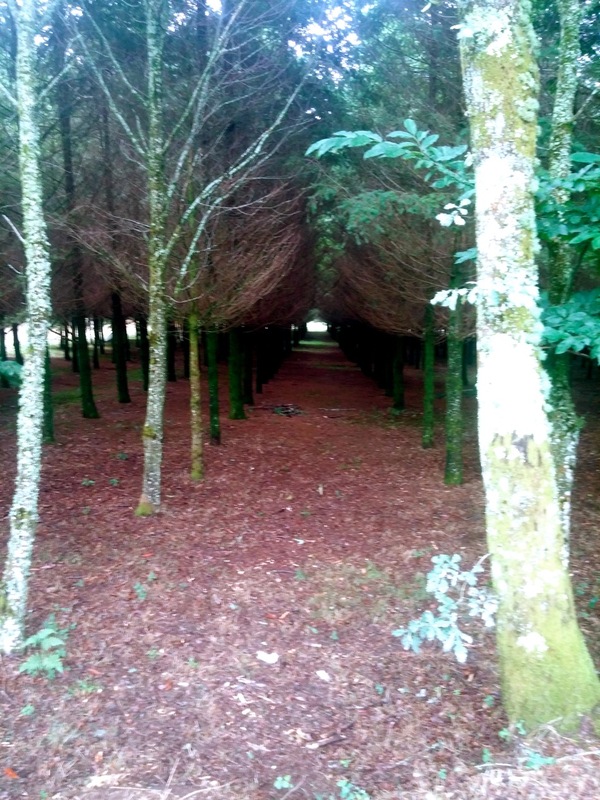 We had become so accustomed to the solitude that came with walking the Norte track, hours upon hours of isolation in the hills and valleys of Basque country, the rocky coasts of Cantabria, the green pasturelands of Asturias and now the Northern woodlands of Galicia. 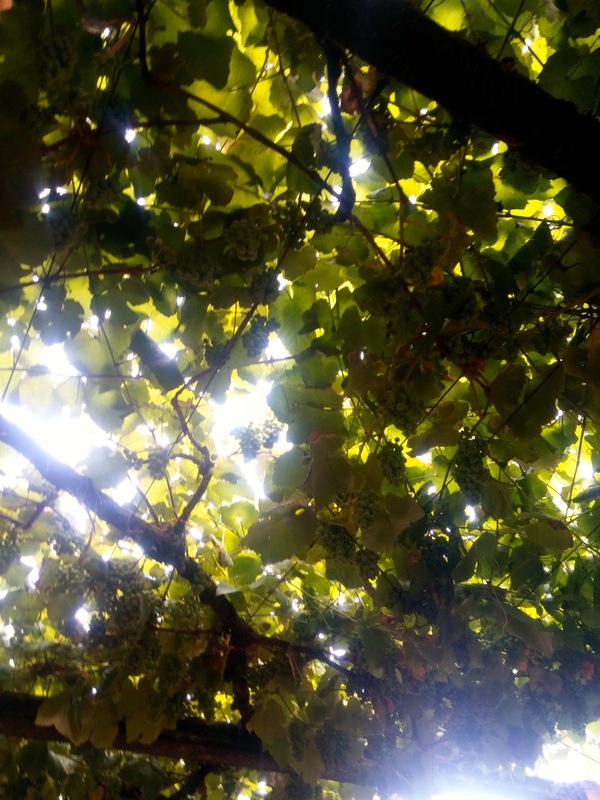 This withdrawal from the everyday hubbub had allowed us to train our ears to different sounds – to the chirrups of the birds and the whispers of the breeze. But here, with a bustling cafe, packed with people, situated around every corner, it was obvious that the quiet wilderness we had known for the past 36 days had been shattered, like a flimsy glass, into a thousand pieces. 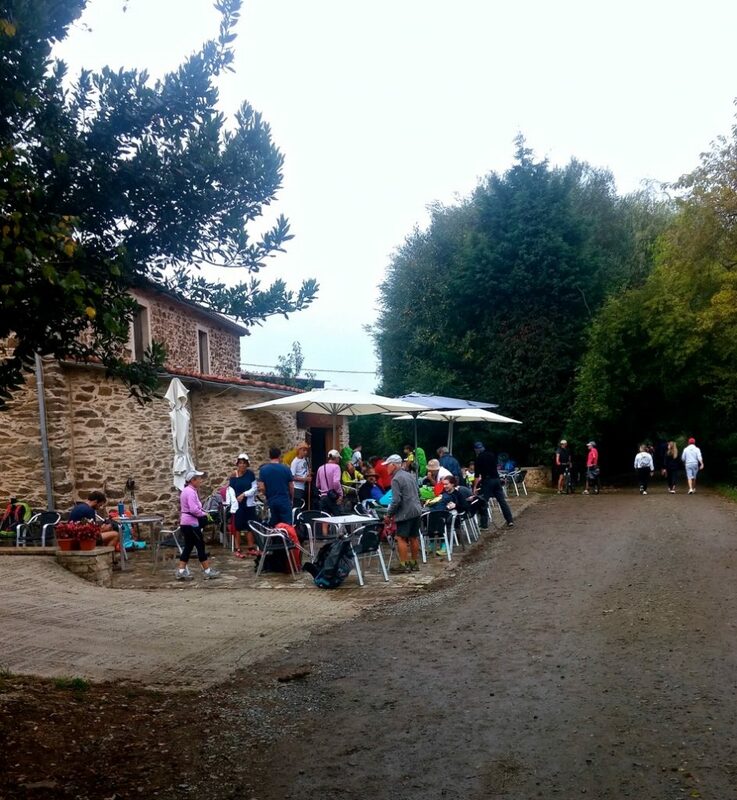 Everywhere around us, our fellow Camino pilgrims filled the path, some familiar but mostly not, and the majority proudly displayed the smaller, red cross shells of the Frances path. 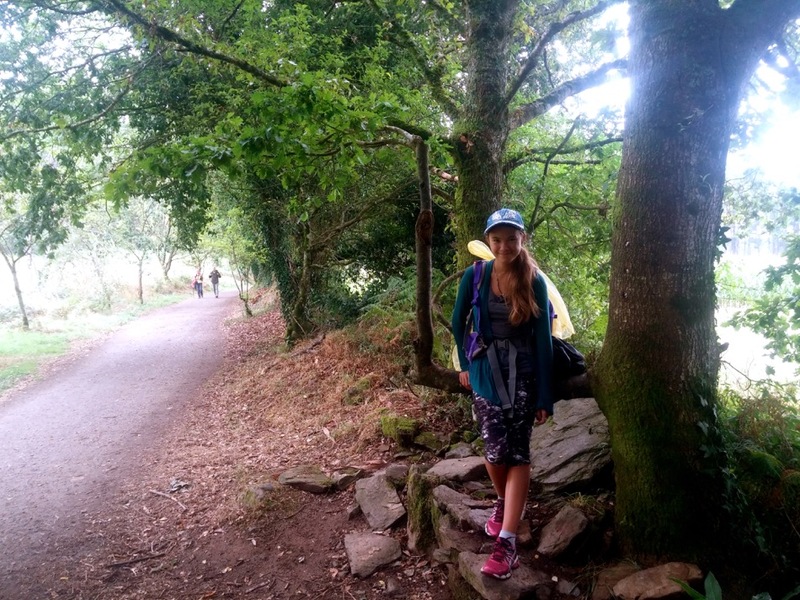 There had been some days on the Del Norte trail where we hadn’t met with any other pilgrims during the entire day. Now, there were over 100 in sight, hastening like a hive of ants towards the coveted mound. 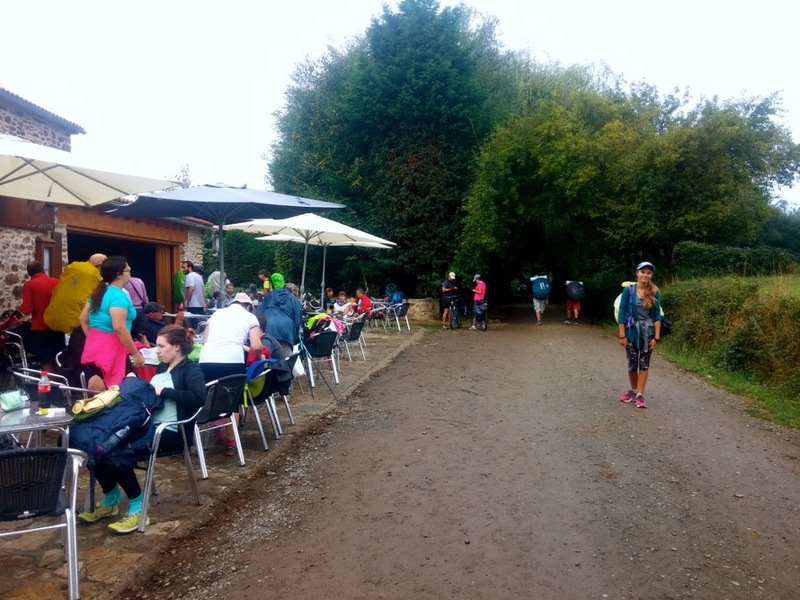 While the Del Norte was over, this part of the Frances trail was equally as stunning, stretching through long winding woodland, occasionally passing by a quaint village that displayed the ever shortening kilometres to our end destination of Santiago de Compostela. 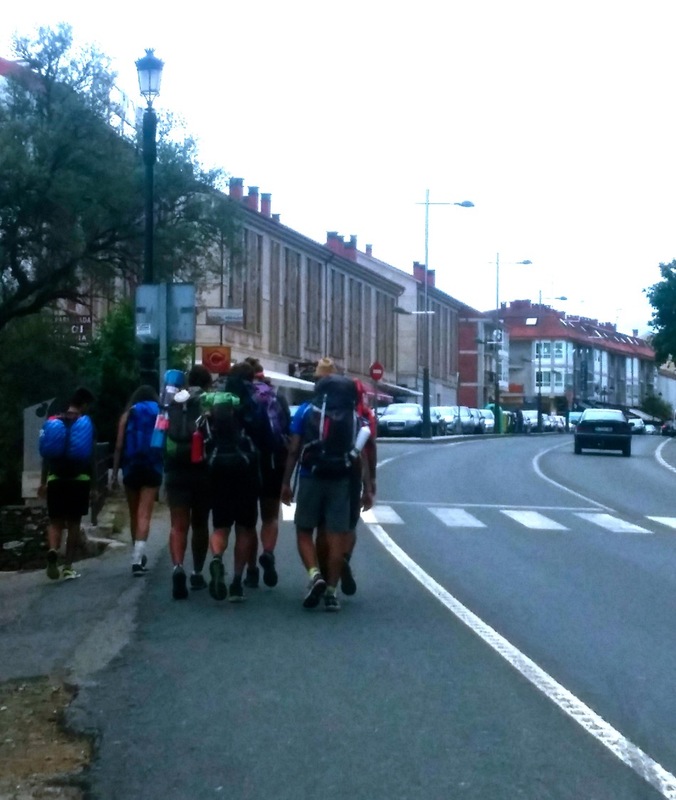 It was a surreal and yet a somewhat melancholic realisation to know that in just one more day we would reach the captivating, trademark Cathedral, the end of the Albergue sleep-overs and the conclusion to our own Camino journey. Yet suddenly, in that moment, I felt my pensiveness wash away and a peculiar sensation ripple through my body. A strange warmth sparked within my limbs and I couldn’t help but smile, for above me, breaking free of its atmospheric prison, was the sun. It had rained bullets of hypothermia for two days straight, dampening our road to the end. Now it seemed the warden had finally relented and the sun had been set free. 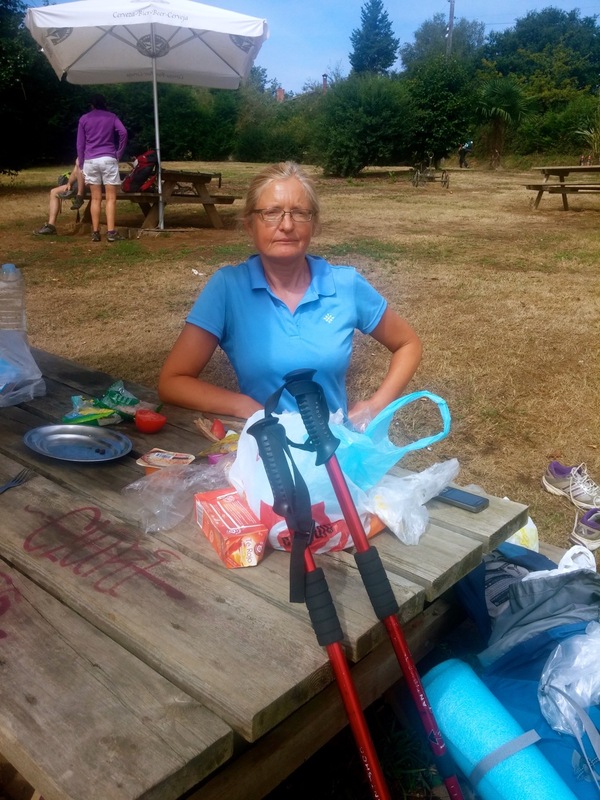 To the edges of the sky, blotches of blue began to appear and by the time we decided to stop for our lunch break on a beautiful stretch of green grass, the curtain to the Spanish Summers we knew and loved were drawn. 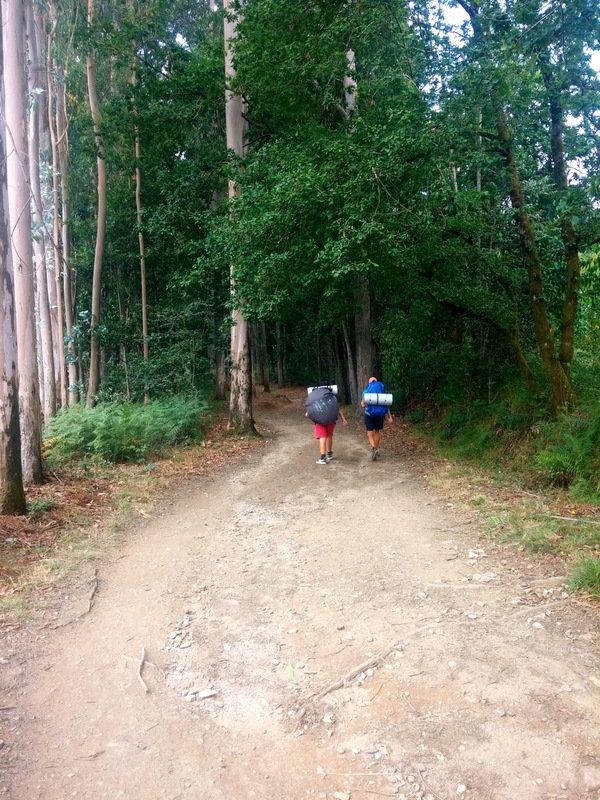 Back on the track, it wasn’t long before we struck up a conversation with an Italian couple keeping pace beside us and in a few moments we were deep in conversation, sharing stories and Camino induced mishaps. Together, we crisscrossed under the branches of a silver oak forest, the light filtering down and setting the entire track ablaze in a joyful tone. When we parted ways an hour or so later, I was surprised to find that for the first time in the entire day, we were alone on the path. 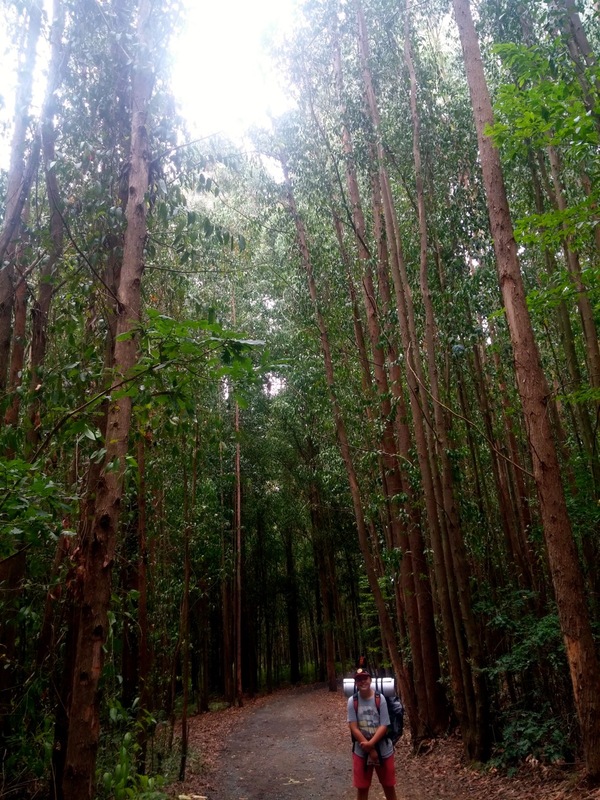 For the next 9 kilometres, we were treated to a secluded forest trail that took us through many a lustrous Eucalyptus plantation. 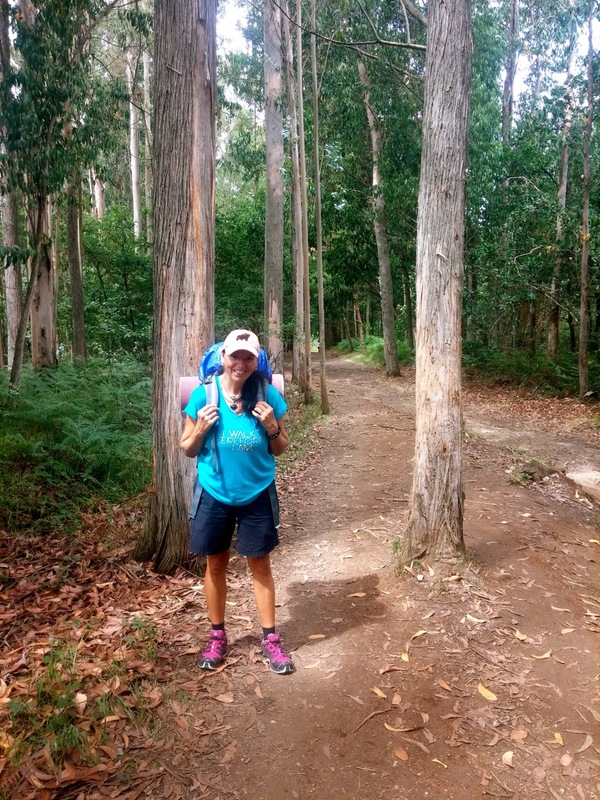 Here we inhaled the sweet smell of our Australian home and closing our eyes we could even imagine ourselves walking the beautiful tracks of Melbourne’s Mount Dandenong Ranges. Maybe it was the scent of the Eucalyptus or the sugar high of our Ice-Cream desserts hitting a peak, but it was here that we began making up parodies of some of our favourite songs. Our most prominent victim became ABBA’s Hasta Mañana. 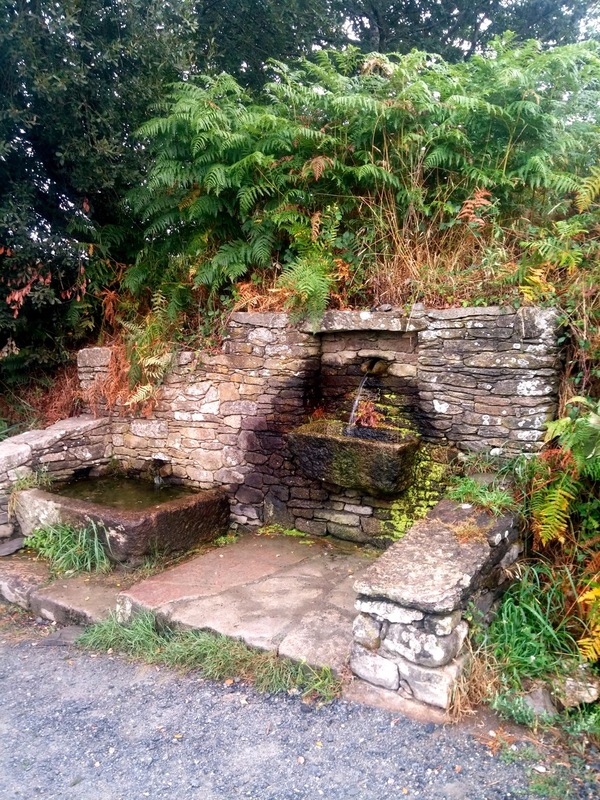 I’ve decided to print our fabricated lyrics here, if not for your reading pleasure, then for my own when I inevitably decide to re-read this blog post a few years down the track and bang my head against the table for my folly in including it at all. Please do excuse the complete and utter silliness of this parody and our sincere apologies to ABBA. Exhilarating afternoon air and gorgeous woodland paths have been proven to cause bursts of foolishness and at times, sheer insanity. You have been warned. I can’t do, without Ragoût! Pasta Mañana with some bread! If you are unfamiliar with the tune, watch the original clip by ABBA. I can guarantee it’ll make much more sense afterwards. Finally, the outskirts of the town of Pedrouzo came into view, the elevated conglomerate of colourful buildings gleaming from across the busy highway. 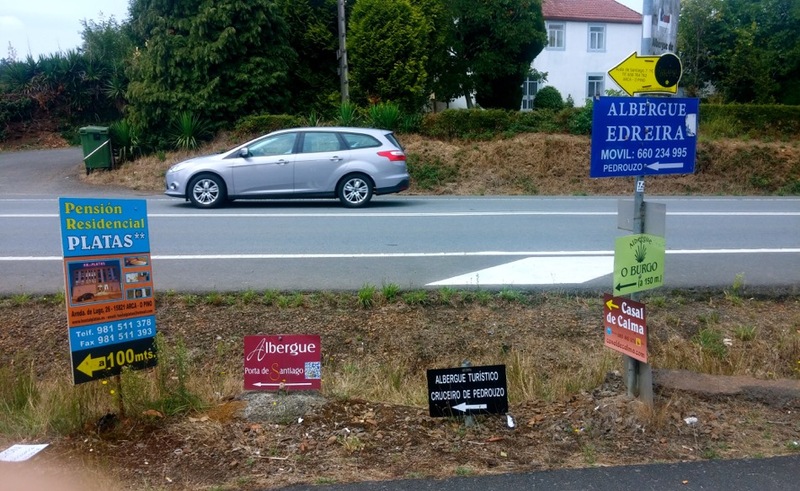 Around us, an infestation of rainbow advertisements dotted the path, each proclaiming directions to the “Best Albergue in Pedrouzo”. 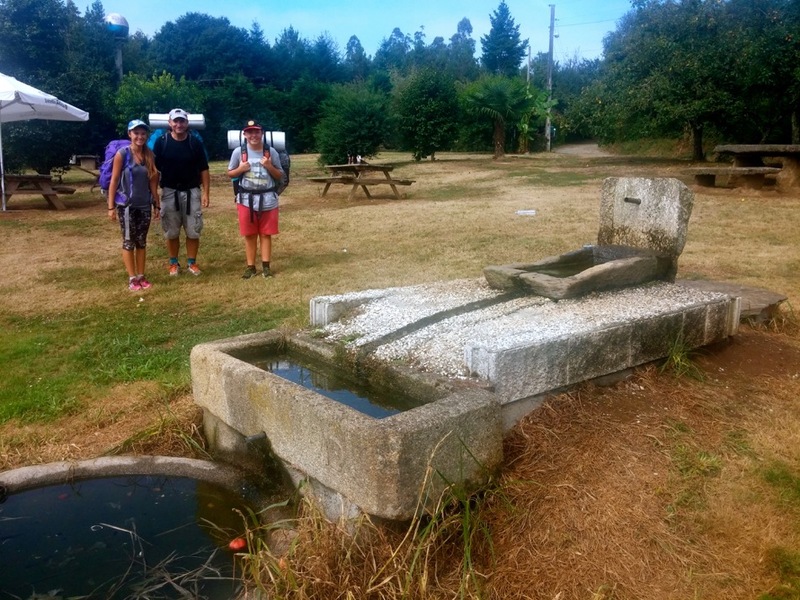 While my family searched for one within our Camino budget, my attention was caught by a large, aloft box, resembling that of an outdoor television, positioned on the side of the road. It wasn’t until I made my way over to peek through the viewing features that I realised it actually was a TV, also advertising an Albergue! The competition in Pedrouzo is certainly steep but I won’t lie, the outdoor TV’s recommendation did win us over. 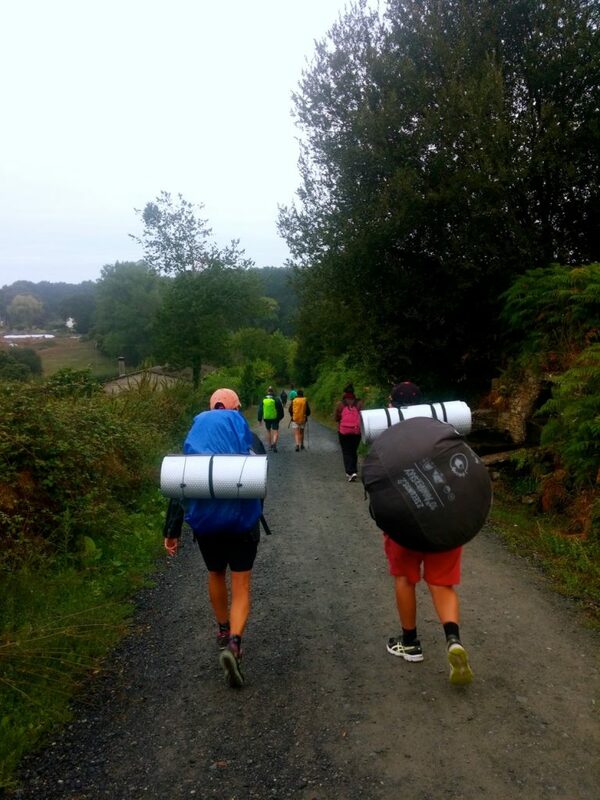 We arrived at the Porta de Santiago, just a few minutes before 4 o’clock, tired, hungry but smiling from ear to ear. An hour later, Hanya also climbed the stairs to the cozy, communal bedroom and occupied a bunk close to us. 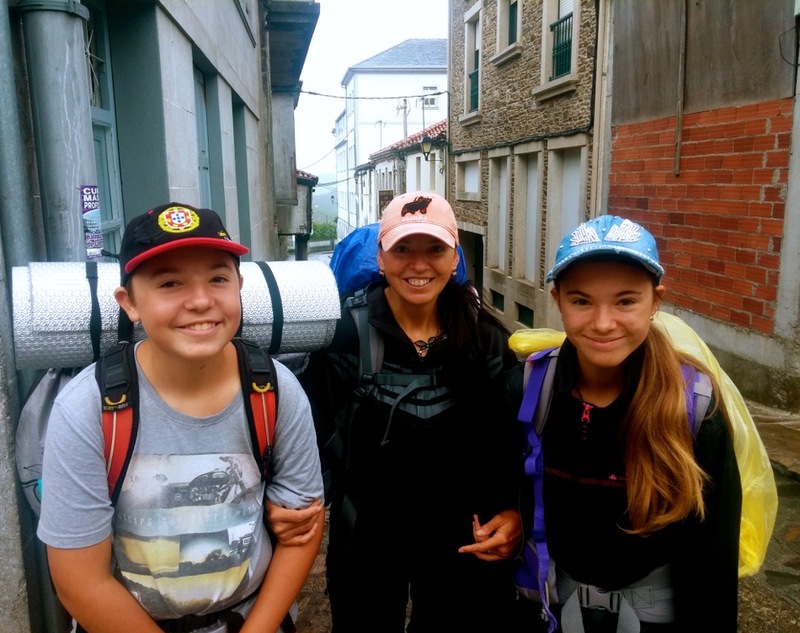 It was still a challenge getting accustomed to the luxurious pilgrim hostels that seemed to be the norm along the Frances, but it was one we would gladly accept. 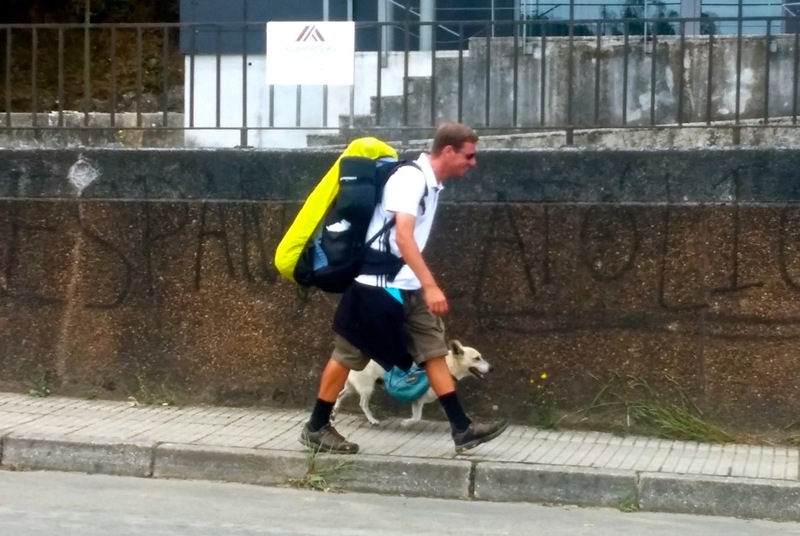 As we made our way to a local Pizzeria to celebrate our last evening on the Camino de Santiago, I spotted a fellow pilgrim making his way into the city. Beside him, padded along his canine walking companion. And it was carrying a backpack. 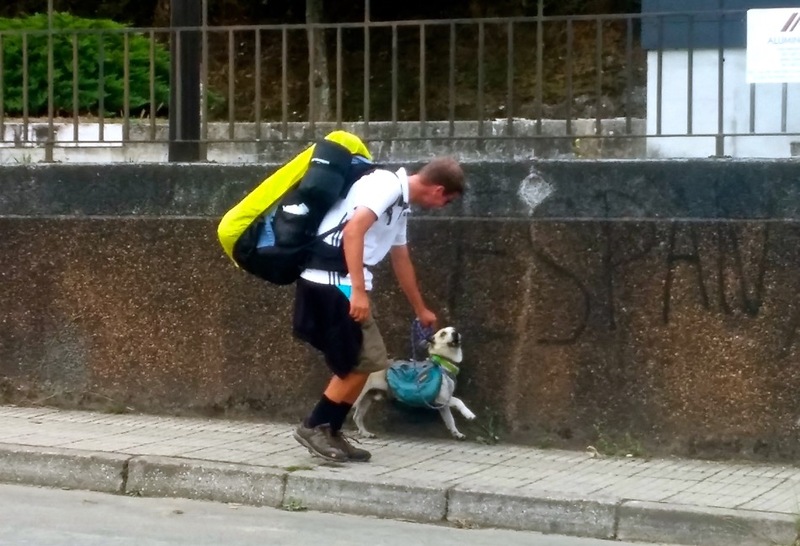 The dog had its very own backpack. We couldn’t help but snap a picture. Just as our flaming hot Pizzas began to arrive at our table, it began to rain. Already fading into the darkness was the road leading out of Pedrouzo and on to Santiago. 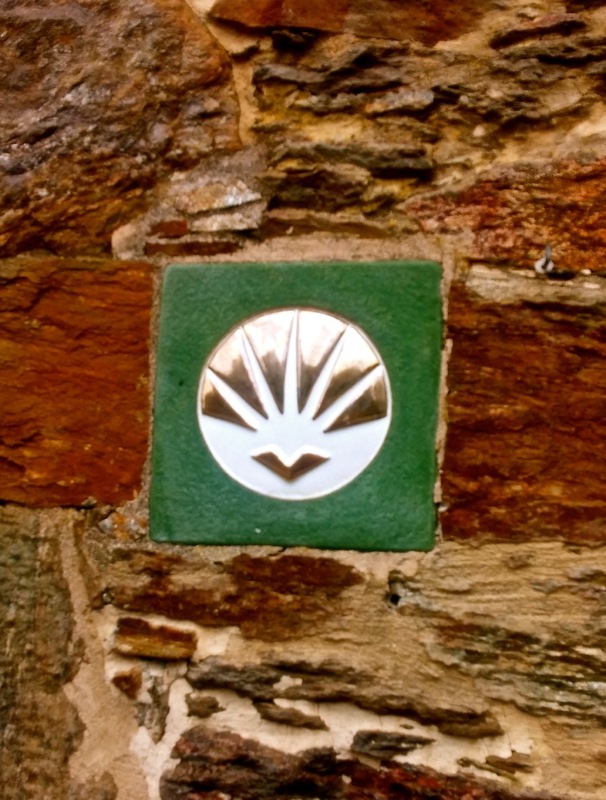 Tomorrow would be our last day on the Camino. 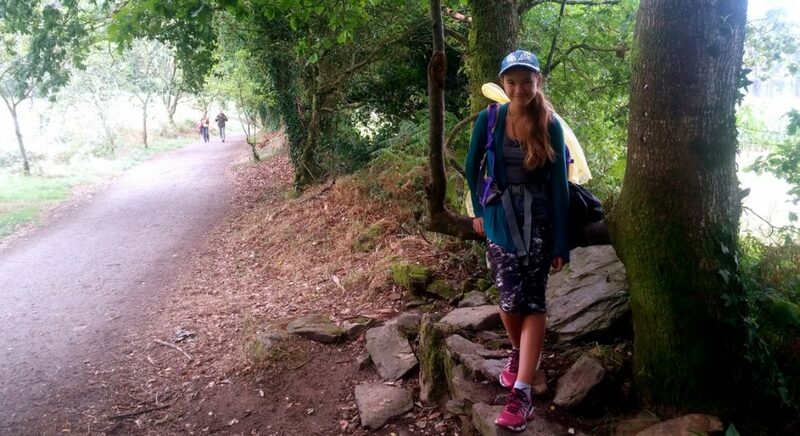 The last time I would pack my backpack as a pilgrim and tie my shoelaces with my heart skipping a beat. The last time I would step out into the cool, dawning light of the sun and keep a lookout for a golden shell sign. The last time I would see the morning dew melt across the grass and feel my skin go numb in the evening shade. My memories flashed before me, 37 days, all in the blink of an eye. My vision hazed and the scent of charred pineapple broke my trance. The buzz of laughter and conversations recounting the day’s adventures filled my ears. I smiled. Then I blinked once more. valahogy boldognak ereztelek nagyon kozel hozzam es ezert en is boldog vagyok! Nagyon varom az utolso beszamolot a Caminorol. Nagyon szeretlek Draga Angyalkaim! !